A celebration of the city's municipal infrastructure, the Panorama of the City of New York gives the viewer a new perspective on the city. Photo by terraplanner. During last week’s Transforming Transportation conference, Jaime Lerner expressed that one of the greatest compliments he has ever received was from his driver who told him that Curitiba looked exactly like the architectural model Lerner was carrying with him at the time. Before geographical information systems (GIS) and three-dimensional modeling programs like Sketch-Up became a wide-spread method of visualizing human settlements and mapping out urban behavior, urban planners used actual models of cities to imagine the past, present and future look of their environments. Modeling is still a large element of architecture but it has lost its practicality in urban planning. In the time it takes to build a model of a city, you can run multiple geospatial analyses using GIS, export your data into Google Earth and generate renderings of your city using satellite imagery. But this does not mean that real-life models have lost their novelty. 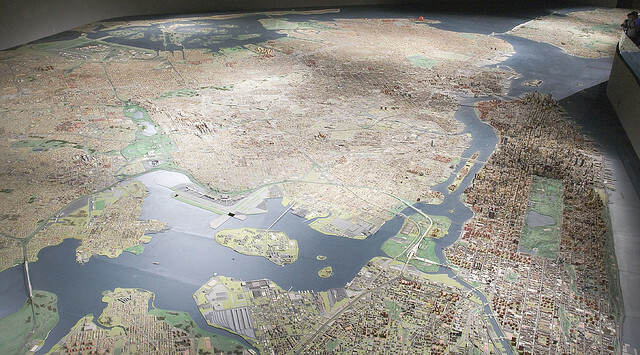 In fact, New York City’s Panorama at the Queens Museum of Art is still one of the most jaw-dropping, beautiful and intricate installations you will ever see. Initially built for the 1964 World’s Fair under Robert Moses’s leadership, the Panorama is a celebration of the city’s municipal infrastructure. The model takes up 9,335 square feet and was built by a team of 100 people. Every single building constructed before 1992 in all five boroughs of New York City are included in the architectural model—a total of 895,000 individual structures. Through the museum you can even “purchase” one of the model buildings for a price as low as $50. Though New York City’s Panorama is impressive, it doesn’t even compare to Hamburg, Germany’s Miniatur Wunderland. As of summer 2010, the Wunderland stood at an amazing 14,000 square feet. After its final construction phase in 2020, experts predict that it will cover 25,000 square feet, will cost $26.4 million and will take 300 people to construct. Wired magazine published a story in 2009 highlighting some other models from San Francisco, New York, Shanghai, Sydney and Chicago. If you want to create some models yourself, you can always visit the National Building Museum and their exhibit on LEGO Architecture. The exhibit will run until September 2012. Do these models speak to you? Do you think they still serve a purpose in urban planning or are they strictly aesthetic attractions?